“Here it comes!” my son Kevin shouted. We felt a rumble beneath our feet. We heard a noise like a roaring train. Boiling water shot out of the ground and blew high into the air. We were watching a geyser in Yellowstone National Park. Yellowstone covers a big part of Wyoming, plus parts of Montana and Idaho. 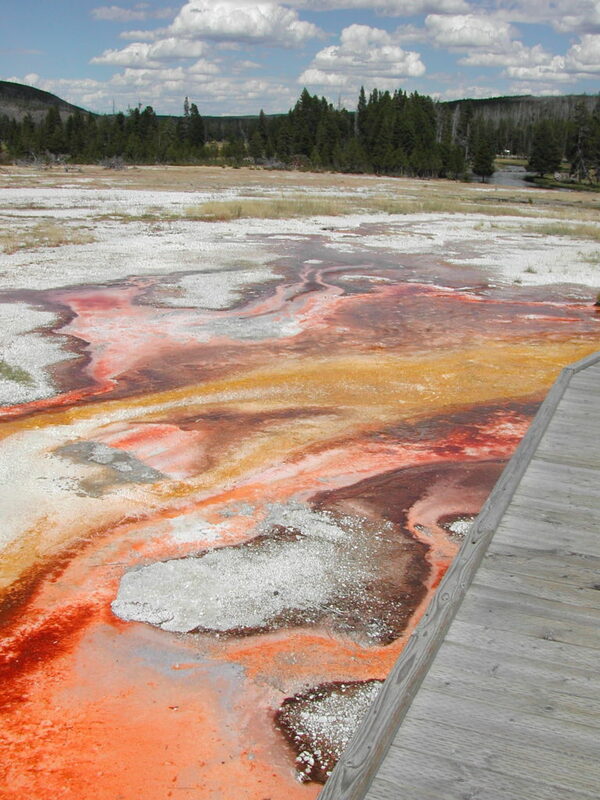 Geysers, hot springs, and mud pots fill the park. That’s because much of Yellowstone sits on a giant volcano! Hundreds of thousands of years ago, the volcano at Yellowstone erupted. The explosion was huge. It left a crater in the earth called a caldera. 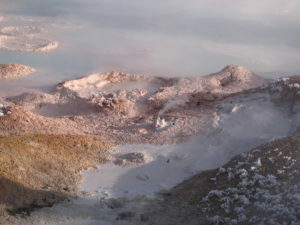 Much of the park is in the caldera. Hot rock lies deep inside the earth. It boils water in the ground. The hottest water becomes steam. 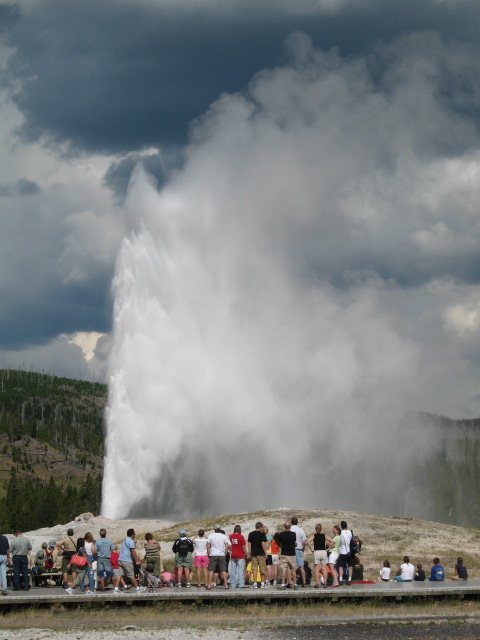 The steam forces water up through the ground, making a geyser. Some geysers shoot water 200 feet into the air. That’s more than twice as tall as the White House. 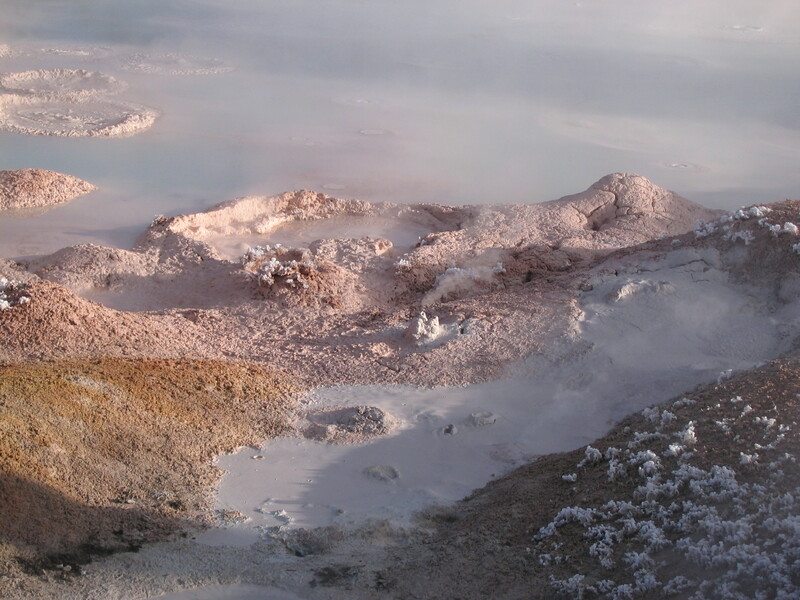 Snow-white rock, called sinter, covers the ground around the geysers. Copper and other minerals in the water turn the hot springs rich blue and yellow-green. Tiny living creatures (bacteria) and plants (algae) grow in the hot water. The bacteria and algae make thick, gooey mats of bright colors. 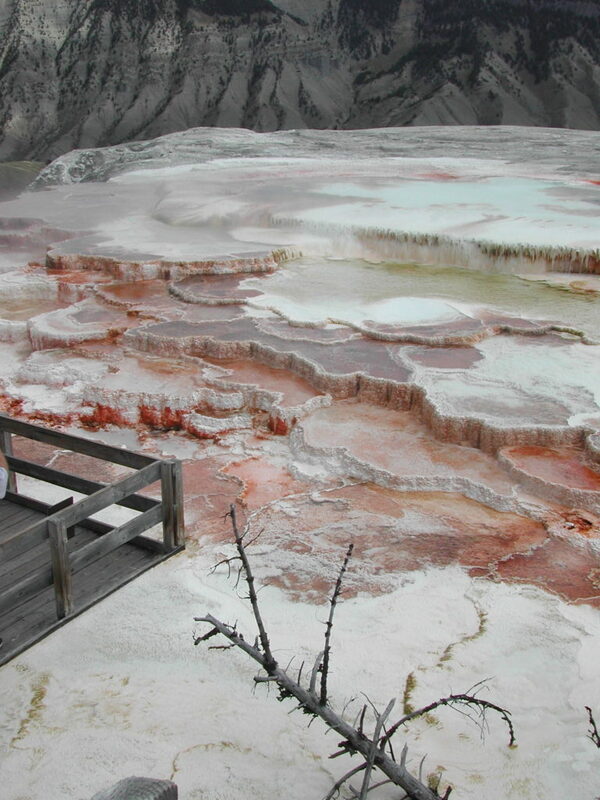 At Mammoth Hot Springs, hot water pours out of cracks in the earth. Then the water cools down. The minerals in the water join together to form stone. Watch out for mud pots! “Mud pots” are hot springs that bubble like thick soup. They can toss steaming mud balls 10 to 15 feet! 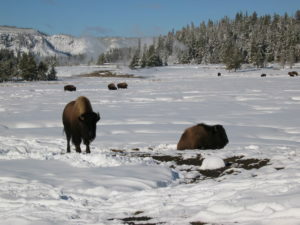 Animals, like buffalo, roam free in the Park. They often lounge around the hot springs to stay warm, especially in winter. But they must be careful not to get burned. Watch out for mud pots! This is a hot spring.